Posts tagged with "iOS 7"
Simone Rizzo has a good post on iOS and the progressive demotion of buttons, arguing that there's a reason Apple has started adding gestures to perform actions that used to be exclusively associated with buttons. Assuming I’m right in spotting this trend of a) removing the need for buttons to interact with iOS or b) removing the need for the buttons to be on a specific point on the screen, the next obvious question is why. Why would Apple move away from an admittedly easy way of interacting with iOS, one that arguably sustained the initial success of the iPhone and iPad? The trade-off with relying on gestures too much is that, without clear borders, shadows, or realistic elements that indicate interactivity and state for buttons, the overall experience can be confusing and the interface difficult to use. A year later, I find myself occasionally struggling to make out buttons from labels, stopping my finger for a fraction of a second as I wonder “Is this a button?”. In other cases, I slow down my swipe because I can't remember if the app I'm in supports that Back gesture. I don't think I'm alone in this, but it's undeniable that gestures – whether suggested (like the Camera shortcut in the Lock screen) or implied – are becoming more prominent in iOS. An OS that doesn't rely on buttons in fixed positions should make for a better experience when using a larger device. The issue with “button” design in iOS is still a hot topic in design circles, and I imagine that gesture discoverability will be as important if Apple is really working on a bigger iPhone. Perhaps some sort of guide to discover features could help. For several years, cellphone theft has been a growing epidemic worldwide. But the police in New York, San Francisco and London say they are finally starting to see a dip in thefts of one of the most popular smartphones. The reason? The attorney general of New York, Eric T. Schneiderman, and the district attorney of San Francisco, George Gascón, share the theory that phone thefts are dropping because of Apple’s addition of a so-called kill switch, a type of antitheft technology, in its iPhone in September. This is great news, and I would like to see Apple push Find My iPhone even more in the future. I'm surprised every time someone tells me they don't know what iCloud or Find My iPhone can do, or that a stolen iPhone can be visualized through the Find My iPhone web interface. It's good to know that Apple's tech is working and that more companies are adopting kill switches for mobile devices. Like many others, I’ve spent the past three days reading and thinking about Apple’s announcements at WWDC. OS X Yosemite. iOS 8. Swift. HealthKit and HomeKit. Improvements to the App Store and iTunes Connect. Continuity and Handoff. Extensibility. There are so many massive, far-reaching changes ahead, digesting the news out of WWDC 2014 will take time. 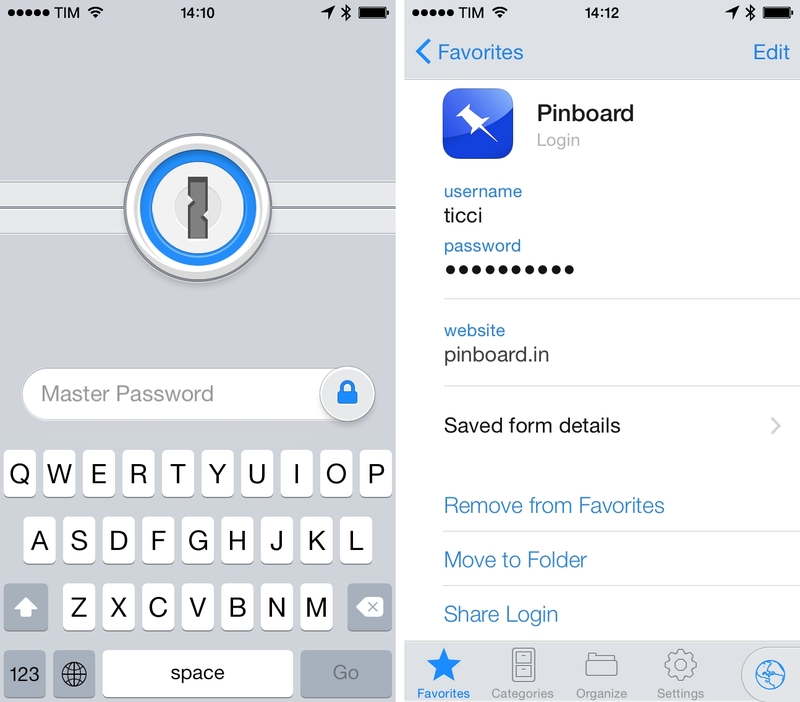 1Password 4 for iOS, first released in December 2012, was a major update to AgileBits' popular password manager that introduced a new design, a powerful built-in browser to manage logins inside the app, and a variety of other features that were later ported to and expanded on OS X with 1Password 4 for Mac. 1Password 4.5, available today on the App Store, brings a complete redesign for iOS 7 and several other changes and feature additions that make 1Password officially optimized for the modern OS, further narrowing the gap between the mobile and desktop versions. I'm a fan of the system-wide Back gesture introduced with iOS 7, but I prefer apps (like Unread and Facebook Paper) that don't force you to swipe exactly from the edge of the screen. I find that kind of gesture implementation comfortable, friendly, and natural. A new app called AnyFont and developed by Florian Schimanke allows you to install custom fonts on iOS. 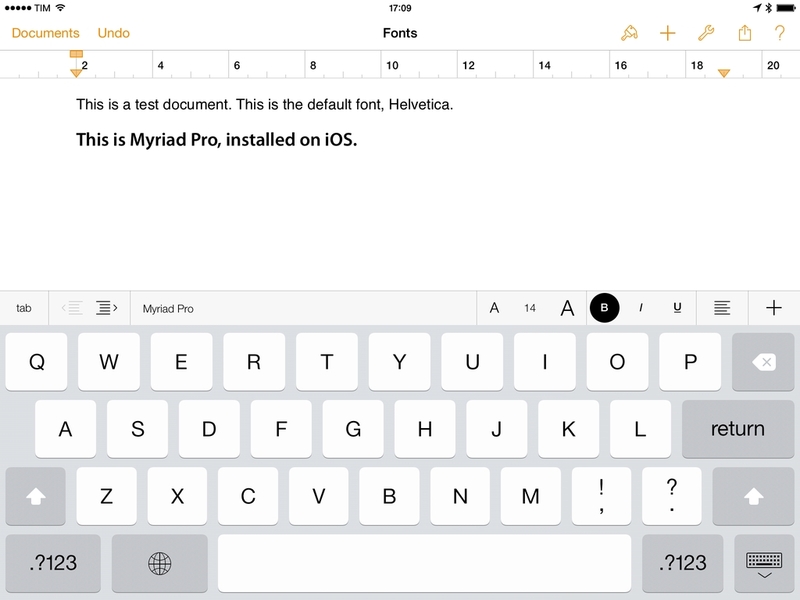 By leveraging iOS 7's capability of installing fonts through a configuration profile (Apple's documentation here), AnyFont can take fonts as standard TTF and OTF files from the app's own storage and install them on iOS so other apps such as Apple's iWork suite will be able to use them in the font picker. I was able to test the app (which was first covered by TUAW in early March) and talk to Schimanke, who confirmed that AnyFont “does exactly what you could do on a Mac with the Apple Configurator”; while installing a custom configuration profile may raise security concerns, he added that it's possible to look at the contents of the profile and see that the one created by AnyFont contains only font files that the user wants to install. 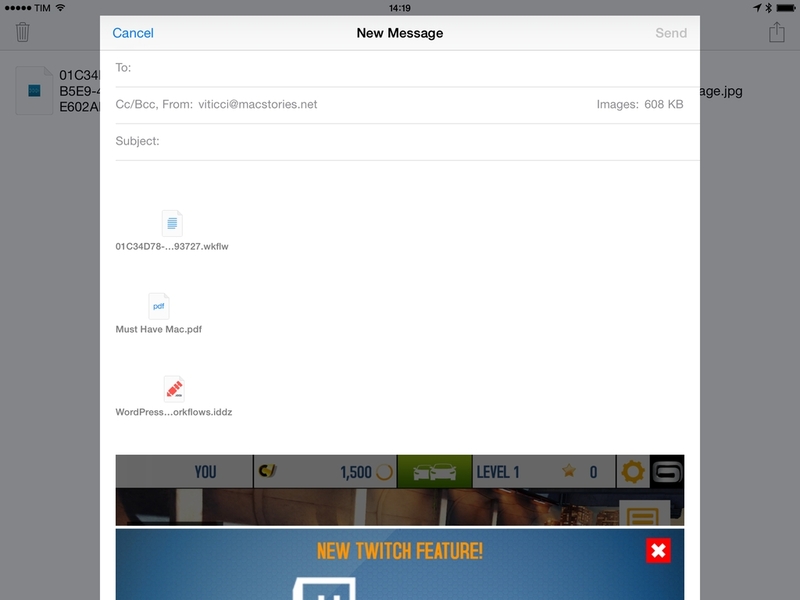 One of iOS' biggest shortcomings is the inability to attach multiple files to an email message. Caused by Apple's resistance to bringing a visible filesystem to iOS or building inter-app communication features to access files outside of an app's own sandbox, the problem is epitomized by antiquated limitations such as the Open In menu and the aforementioned lack of multiple attachments in Mail. Interestingly, these two limitations are exactly what Multiple Attachments, developed by Jan Mazurczak, uses to send email messages containing attachments that aren't just photos or videos. For The Guardian, Craig Grannell writes about many of Apple's new animations for iOS 7.1, and what that means for people who previously got motion sick. While iOS 7 had lots of nice visual touches, bouncy animations and parallax effects made some customers feel physically ill when using their iPhone. In addition to numerous visual changes that aim to reduce physical illness in iOS 7.1, Apple has also been hard at work making iOS even more accessible by reintroducing button hints. Josh de Lioncourt at Macworld also runs through some new additions in accessibility that should help those with low-vision or motor impairments. For example, the camera button can be turned into a switch that turns on head tracking, reducing the need for a separate device. 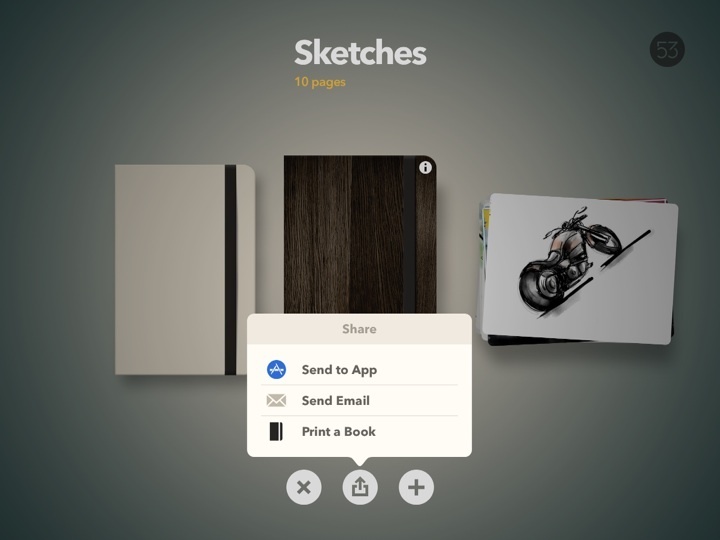 Paper is one of our must have apps, and it’s recently been updated with iOS 7 in mind. While the app’s design and personality free it from many of iOS 7’s visual styles, popovers and menus have been refreshed with a flatter, cleaner look. Two additional small but important changes to Paper’s drawing tools should make drawing detailed characters, things, and environments much easier than before. When using the loupe to zoom in, the drawing tools you use will adjust their size as well, giving you finer control over all of the smaller details. And lastly, drawing dots has become much easier, with long presses generating bigger dots. Paper is free to download in the App Store, with tools available for sale in the app individually or as a bundle.